Role of radiotherapy in the management of carcinoma stomach is well established in clinical studies. For achieving adequate locoregional control, external radiotherapy with concurrent chemotherapy is considered a standard of care in locally-advanced carcinoma of the stomach. Difficulty in delivery of external radiotherapy was considered challenging due to the toxicity of neighboring structures. Because of this reason many radiotherapy centres do not offer external radiotherapy to their patients. Different radiotherapy delivery techniques have been described in the literature, including two-dimensional (2D), three-dimensional (3D), and conformal radiotherapy techniques such as intensity modulated radiotherapy (IMRT). IMRT plans significantly reduced the radiation dose distribution to normal organs. A good radiotherapy dose distribution to the stomach bed and regional nodes can be achieved with IMRT planning. Even though IMRT was found to be a good technique, numerous limitations have been identified. The investigators at the Princess Margaret Hospital stated that IMRT was associated with reduced dose homogeneity, which can produce high dose spots in the small bowel. They cautioned that there is a need for detailed information regarding organ motion in the upper abdomen and that implementation of breath hold or gating techniques may be necessary prior to the adoption of IMRT in routine clinical practice. Breathing movements during treatments can alter the dose distribution to the target area and the dose limiting structures. Different techniques such as 2D treatments (2DRT), 3D conformal radiotherapy (3DCRT), image-guided treatments (IGRT), and respiratory gating techniques have been described in the literature. Each technique has its own advantages and disadvantages. Most of them are time consuming and need maximum cooperation from the patient. Reproducibility during every day treatment is another challenge. Investigators at the Princess Margaret Hospital obtained abdominal computed tomography (CT) scans in the states of free breathing, inhaling, and exhaling for 17 patients undergoing postoperative radiotherapy for gastric cancer and organ motion was found to be significant, with mean 17.5 mm craniocaudal displacement, 5.9 mm anteroposterior displacement, and 2.7 mm right-to-left displacement. Considering these factors we tried a simple and easily reproducible technique. That is, using an abdominal compression device to reduce the internal target motion and deliver IMRT for stomach cancer. Reduction in the internal target motion will definitely reduce the dose to normal organs as well as the total treatment volume. These benefits will ultimately reflect in better dose delivery to the target volume. An abdominal compression device was made with the help of available literature. The compression device was a simple one, and can be very conveniently used in all patients without much difficulty and the reproducibility was also good. Because the device was not routinely used and the data available from literature for using the device for treating stomach cancer patients were limited, we planned a pilot study. Carcinoma stomach patients registered in the radiation oncology outpatient department of our institution who satisfied the inclusion criteria were included in the study. Inclusion criteria included (1) Carcinoma stomach postop (stage IIA to Stage IIIC AJCC Staging manual 2010); (2) Eastern cooperative group (ECOG) staging performance score: 0 and 1; (3) Surgical clips placed in the tumor bed; (4) Normal liver and renal function. Exclusion criteria included (1) ECOG performance score of 2 or above; (2) Obstructive pulmonary disease patient with compromised pulmonary function; (3) Ischemic heart disease patients. Abdominal compression device consisted of a triangular Styrofoam's plate and an inflatable air bladder that was positioned over patients [Figure 1]. 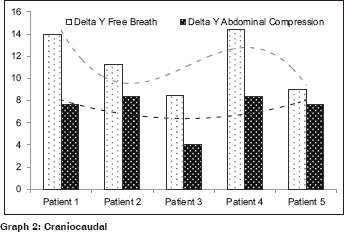 On the simulation day, compression device was placed over patient's abdomen and a pneumatic pressure was set according to patients' comfort [Figure 2]. Patients had two CT-scanning sessions, with and without abdominal compression. Three millimeter slice thickness scans were acquired and transferred to the treatment planning system (TPS) (Eclipse version 11.0). In TPS, the target volumes and organs at risk (OAR) were delineated on the CT images without compression. All patients were offered radiotherapy with the IMRT technique at a total prescribed dose of 45–50.4 Gy in 25–28 fraction (1.8-Gy per fraction) along with daily capecitabine (825 mg/m2). On the treatment day, fluoroscopy was acquired with onboard imager (OBI) to visualize the motion of the surgical clips with and without compression. 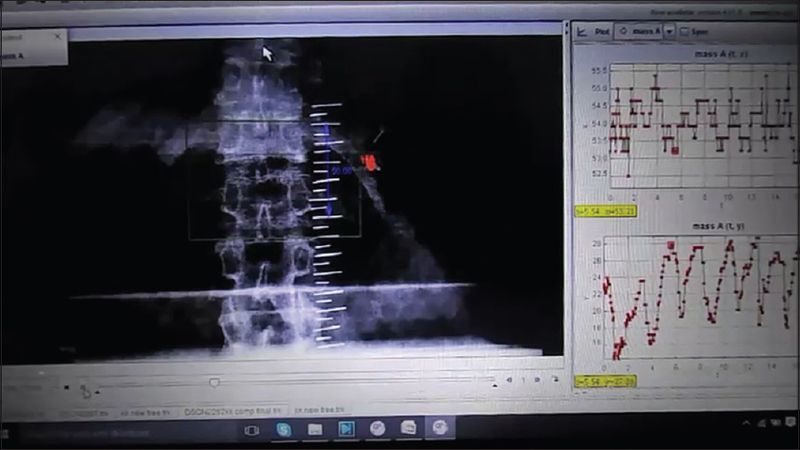 The fluoroscopic images obtained were exported to tracker software [Figure 3], analyzing the movements of surgical clips for craniocaudal and mediolateral direction. 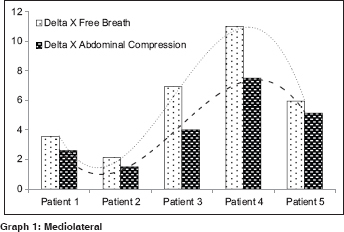 Observed values of with and without abdominal compression were compared. The pilot study done on 5 patients who received adjuvant conformal radiotherapy for carcinoma stomach using abdominal compression device showed the following results. All patients included in the study received conformal radiotherapy as an adjuvant treatment. Treatment details are mentioned in the [Table 1]. Surgical clips were present in all the patients. The movement of surgical clips was recorded for each patient [Table 2]. Mean mediolateral (delta X) without compression was 5.92 mm and with compression was 4.15 mm, meancranio caudal (delta Y) without compression was 11.3 mm and with compression was 7.2 mm [Graph 1] and [Graph 2]. The range of reduction was 29.85% in the ML and 36.86% in the CC direction. The average residual breathing excursion was 1.766 mm (SD = 1.33 mm) in the ML and 4.02 mm (SD = 2.18 mm) in the CC direction. Abdominal compression device usage helps to reduce the internal organ movements during the treatment of carcinoma stomach using conformal radiotherapy. In our pilot study, craniocaudal movements reduced from 11.3 mm to 7.2 mm and mediolateral movements reduced from 5.9 mm to 4.1 mm. Similar studies using abdominal compression devices have been reported in the literature for treating other types of malignancies. Because the treatment sites are different, direct comparison with other studies may not be accurate. Lovelock et al. reported a similar device usage for the treatment of liver lesions using stereotactic body radiotherapy. They found that the compression device could reduce the target motion by a factor of 2.6 in the craniocaudal direction. Applying a constant pressure on the abdomen, Lax et al. reported that motion of liver malignancies ranging from 15 to 25 mm was reduced to 5 to 10 mm. Another study done by Wunderink et al. showed a median motion reduction in 12 liver patients, 62% in the craniocaudal, and 38% in the anteroposterior direction with respect to the median free-breathing excursions. Breathing movements are a major concern in the treatment of lung lesions. Reductions in respiratory motion by the use of similar devices have been described in literature. Negoro et al. found that the pressure plate usage of a similar design reduced the movements from 8–20 mm to 2–11 mm. Another similar study by Hof et al. reported in a group of 20 lung cancer patients abdominal compression reduced the movements with the mean and standard deviation of 5.1 ± 2.4 mm. In practice abdominal compression device reduced the craniocaudal movements and lateral movements to a significant level. Conformal radiotherapy treatment of stomach cancer in adjuvant settings with compression devices shows a definite advantage in terms of movement reduction and better dose distribution. The simplicity of this system makes it a more feasible option to use on a daily basis at any oncology centre. Movement reduction for each patient has to be calculated separately, and these variations need to be incorporated in the treatment planning. An overall reduction in the treatment volume will account for better conformity in delivering IMRT to stomach cancer patients. The advantages of abdominal compression devices in the treatment of stomach cancer in postoperative settings were clearly understood from this study. A routine clinical use of this device will help to identify further aspects of this device usage, and needs to have a more systematic approach and clinical follow-up. In short, conformal radiotherapy treatment in stomach cancer can be modified in terms of accuracy and dose distribution with the help of abdominal compression devices. John S. Macdonald, Stephen R. Smalley, Jacqueline Benedetti, Scott A. Hundahl, et al. Chemoradiotherapy after Surgery Compared with Surgery Alone for Adenocarcinoma of the Stomach or Gastroesophageal Junction. N Engl J Med 2001;345:725-30. Smalley SR, Gunderson L, Tepper J, Martenson JA Jr, Minsky B, Willett C, et al. Gastric surgical adjuvant radiotherapy consensus report: Rationale and treatment implementation. Int J Radiat Oncol Biol Phys 2002;52:283-93. Wieland P, Dobler B, Mai S, Hermann B, Tiefenbacher U, Steil V, et al. IMRT for postoperative treatment of gastric cancer: Covering large target volumes in the upper abdomen: a comparison of a step-and-shoot and an arc therapy approach. Int J Radiat Oncol Biol Phys 2004;59:1236-44. Milano MT, Garofalo MC, Chmura SJ, Farrey K, Rash C, Heimann R, et al. Intensity-modulated radiation therapy in the treatment of gastric cancer: Early clinical outcome and dosimetric comparison with conventional techniques. Br J Radiol 2006;79:497-503. Ringash J, Perkins G, Brierley J, Lockwood G, Islam M, Catton P, et al. IMRT for adjuvant radiation in gastric cancer: A preferred plan? Int J Radiat Oncol Biol Phys 2005;63:732-8. Susan A. McCloskey, Gary Y. Yang Benefits and Challenges of Radiation Therapy in Gastric Cancer: Techniques for Improving Outcomes. Gastrointest Cancer Res 2009;3:15-9. Brandner ED, Wu A, Chen H, Heron D, Kalnicki S, Komanduri K, et al. Abdominal organ motion measured using 4D CT. Int J Radiat Oncol Biol Phys 2006;65:554-60. Lovelock DM, Zatcky J, Goodman K, Yamada Y. The Effectiveness of a Pneumatic Compression Belt in Reducing Respiratory Motion of Abdominal Tumors in Patients Undergoing Stereotactic Body Radiotherapy. Technol Cancer Res Treat 2014;13:259-67. Lax I, Blomgren H, Naslund I, Svanstrom R. Stereotactic radiotherapy of malignancies in the abdomen. Methodological aspects. Acta Oncol 1994;33:677-83. Wunderink W, Méndez Romero A, de Kruijf W, de Boer H, Levendag P, Heijmen B. Reduction of respiratory liver tumor motion by abdominal compression in stereotactic body frame, analysed by tracking fiducial markers implanted in liver. Int J Radiat Oncol Biol Phys 2008;71:907-15. Negoro Y, Nagata Y, Aoki T, Mizowaki T, Araki N, Takayama K, et al. 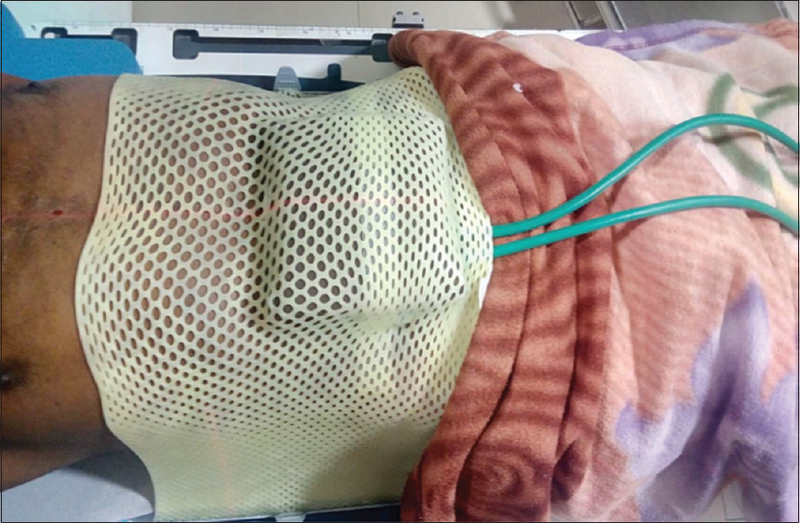 The effectiveness of an immobilization device in conformal radiotherapy for lung tumor: Reduction of respiratory tumor movement and evaluation of the daily setup accuracy. Int J Radiat Oncol Biol Phys 2001;50:889-98. Hof H, Herfarth KK, Munter M, Essig M, Wannenmacher M, Debus J. The use of the multislice CT for the determination of respiratory lung tumor movement in stereotactic single-dose irradiation. Strahlenther Onkol 2003;179:542-7.